Assistive Technologies for Motor Disabilities! There are a wide range of technologies for people with motor disabilities! Take a look at a few here! What is a mouth stick? A mouth stick is a stick that is placed in the mouth and the long end hangs out of the individuals mouth. The end of the stick can be used by a person that has no use of their hands to type as well as try to manipulate a trackball device with it. The mouth stick requires a lot of patience and practice! What is an eye tracking device? An eye tracking device is an assistive technology device that has the meaning exactly in the word itself; It tracks a person's eyes! This device tracks a person's eye movements, and the person is able to navigate the internet or web just by looking at wherever they look, and then the action is completed with just the movement of their eyes! Very cool! 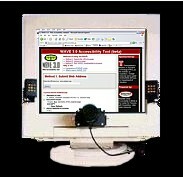 Voice recognition software is an assistive technology program that can be installed into your computer so that your voice is able to control the computer and what it does! It can be very ideal for a student typing a paper, as whatever words the student says gets put right onto the document! A very useful tool for those with limited mobility!